Easter is a wonderful time of year, especially at Cross Keys Arcade Salisbury. We’re on the Salisbury BID Easter trail! 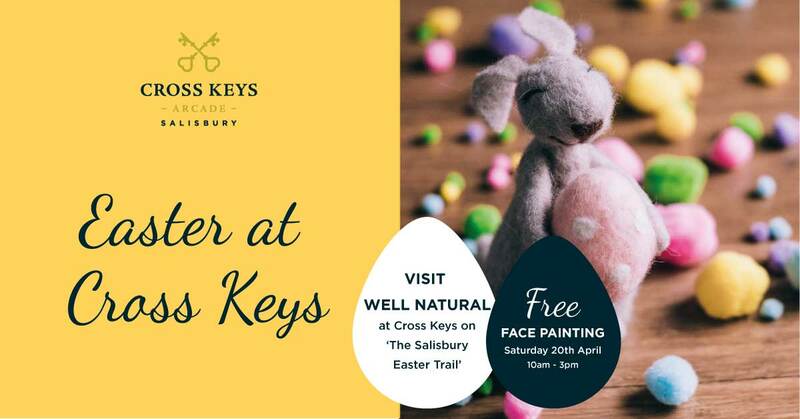 Between Saturday 6 April and Monday 22 April, get the whole family together and take on the challenge of the Salisbury Easter Trail stopping at Well Natural, Cross Keys Arcade. Help Harvey find the names of his 12 friends located in the city centre. Look out for the horses in the windows of businesses that are marked on the trail map. There may even be an edible Easter treat inside the businesses for trail-goers! Download a trail map here. We are delighted to welcome back the Face Painting Fairie this Easter. Fun for all the family on Saturday 20 April 10am-3pm! WIN a giant chocolate Easter Egg! Keep an eye out for the Salisbury Journal’s Facebook competition, giving you the chance to win a giant Cross Keys Easter Egg. Cross Keys Arcade is situated in the heart of Salisbury, off Guildhall Square. Retaining its original Jacobean staircase Cross Keys Arcade was established over 25 years ago. The shopping centre includes a combination of leading UK brands and local independent retailers including A Plan Insurance, Blinkers Hair Salon, Cool! Merchandise, Eden Hair of Salisbury, Eurochange, Gallery 21 Fine Art, Games Workshop, Goodfayre, Richmond Classics, Ryman, Salisbury Reds, T K Maxx, Vinyl Collectors and Sellers and Well Natural. There are also some great places to eat and catchup with friends at Cross Keys Restaurant, Subway and Wildwood. Please check individual shop opening hours.